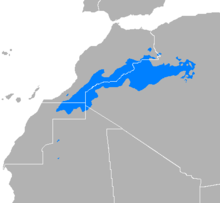 Algerian Saharan Arabic (also known as Saharan Arabic, Tamanrasset Arabic, Tamanghasset Arabic) is a structurally distinct variety of Arabic spoken by an estimated 100,000 people in Algeria, predominantly along the Moroccan border with the Atlas mountains range. It is also spoken by about 10,000 people in neighbouring regions of Niger and Mali. ↑ Hammarström, Harald; Forkel, Robert; Haspelmath, Martin; Bank, Sebastian, eds. (2016). "Algerian Saharan Arabic". Glottolog 2.7. Jena: Max Planck Institute for the Science of Human History.